EnCompass is designed for married couples who have completed the Agapè Catholic Marriage Prep Pre-Cana Course. The program is meant to support them in the first years of their marriage. It consists of two, one-hour (2x 55 minutes) long Skype or phone sessions with a married mentor couple. The membership is good for the first ten years of the couple's marriage. It is a follow-up to the Agapè Catholic Marriage Prep course. The cost of the EnCompass membership is $119.99. 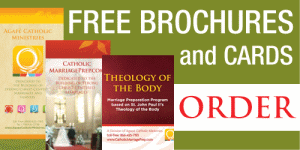 NOTE: When couples order the program within 6 months maximum following the completion of their Agape Catholic Marriage Prep Pre-Cana Course, they are offered a substantial discount of $70 OFF. At checkout, they will need to enter the unique coupon code provided in their last assignment. Additional time can also be bought beyond the first pair of one-hour sessions at $60 per hour.